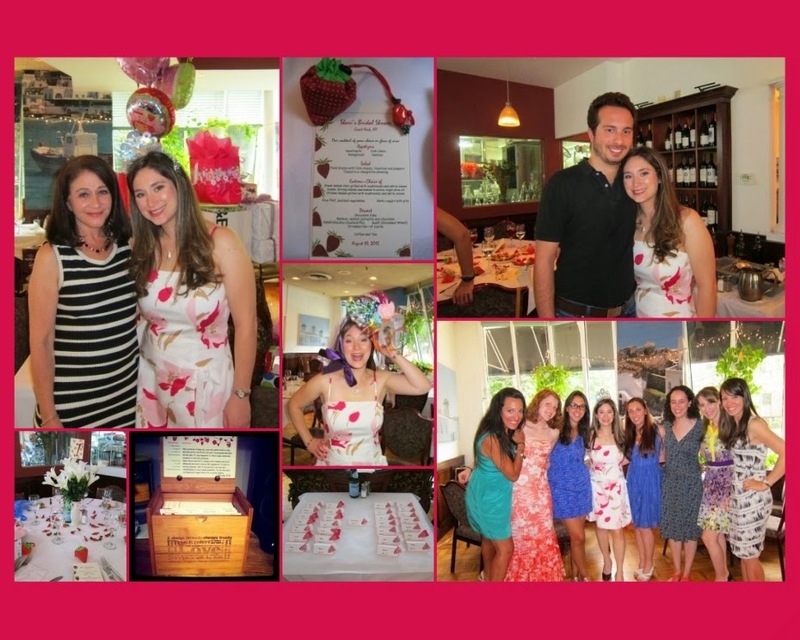 In the theme of catching up from my summer hiatus, today's post recap's my bridal shower. My mom and MOH organized a perfect shower at a local Greek restaurant. Since it was a Saturday afternoon, instead of giving us a small side room, the restaurant let us have the party in the main dining room which is beautifully decorated with paintings of Greece and has huge windows letting in lots of light. One of the highlights was the theme - Strawberries! One of my favorite fruits (and ice cream flavors) has always been Strawberries, even my first AOL screen name had strawberry in it. Everything from the invitations to the menus, place cards and dessert had strawberries! And of course the favor was strawberry themed too, it is a reusable grocery bag that folds up to look like a strawberry. From top left clockwise: Me and Mom, Strawberry theme, Adam stopping by, Me and Bridesmaids, Me in awesome bow bonnet, place cards, recipe box, table decorations. A lot of my friends and family came in from out of town just for the event and I was really touched that everyone made it out to celebrate. All the food was delish too! I did do the whole opening gifts in front of everyone thing, which I'm sure everyone got bored with. My bridesmaids all chipped in and MOH spearheaded a project where she collected recipes from everyone who was invited, and put them on recipe cards (with strawberries on them) and had a beautiful wooden box engraved as a perfect gift. As you know from my Recipe Mondays, I can always use a new good recipe. After I opened all my gifts one of my bridesmaids made me the best bow bonnet I have ever seen! I am Shariously lucky to have so many friends and family shower me with love!